Hello. I thought I’d give you another update on where things stand with Jody. He’s still in the hospital and has been getting his antibiotics (Meropenem, Colistimethate, and Linezolid) without difficulty. Hopefully this combination will be sufficient to knock the “bugs” out of him. He had the blood gases done that I talked about in my last post, and they confirmed that he’s not getting rid of enough carbon dioxide (CO2), particularly when sleeping. To explain this very simply, when we breathe, we inhale oxygen, and exhale CO2. Because of Jody’s advanced lung disease his body has a hard time keeping his airways open well enough at night for the CO2 gas to be expelled properly. Instead, it builds-up in him, and is primarily manifested in the form of headaches when he wakes up. Treatment for this problem is the use of CPAP (Continuous Positive Airway Pressure). This is a mask Jody will wear to sleep which will deliver both oxygen, and a continuous pressure into his airways, forcing them to stay open so the CO2 can be expelled efficiently. This will also help the oxygen to more effectively get to where it needs to go. You may have heard of CPAP before because it is the same treatment used for those with sleep apnea. Jody will wear the CPAP mask here for a few nights and then will have repeat blood gases to see if it was effective in getting rid of his CO2. If not, they will make changes to the settings (the pressure) and try again. This looks really uncomfortable to sleep in, and we’re told might take some time getting used to. I told him he looks like an O2 superhero. All kidding aside, pray that this adjustment goes smoothly and Jody will be able to sleep well and wake up headache free. Upon discharge we are also going to need to change the portable oxygen set-up we have at home for Jody to use when he goes away. Currently he uses a system that only gives him oxygen when he takes a breath in (not a continuous flow). With this method he can get about five hours use from each tank with it set at 2L. The problem is he’s just not getting enough oxygen. He needs the continuous flow, and more like 4L (which is what he uses at home). This means we are going to need to exchange our small portable O2 tanks in for the big ones, and at 4-5L of continuous flow it won’t give him a lot of time to be away from home. It feels like he’s become home-bound. Our lives have changed a lot this past year and it sounds like this is just one more thing to get used to. I think this (combined with the new need for CPAP), makes him all the more ready for transplant. It’s so hard to watch him go through all of this, but truly, he takes it all in stride. There has been no talk of discharge yet, and honestly, we haven’t even asked about it. We’ve learned to be patient, and that even if they did give us an estimated discharge date it would probably change when the time came. I have been able to spend the last four days at Jody’s bedside and it has been great. Today I will return home to uphold my commitments to work. One great thing about Hopkins is that when I leave him here, I always know he’s in good hands. Sending Holland Love to you all! Hoping you will all be home together soon. Jody and Tiff, Paul needed 4L too, so whenever we went to someone’s home we took the concentrator with us along with the port. tanks. I was able to lift it in and out of the back of our mini van. It helped us be able to stay longer and enjoy family and friends. (I did not let the O2 people know). Just kind of stayed under their radar. We had lots of tubing! Give my love to the docs and nurses at JHH! Praying, praying, praying. Wouldn’t he be using a Bi-pap not a CPAP… bi-paps push air in at a higher flow rate with every inhale then continue to push air in but at a slightly lower flow rate for the breath out. I use a Bi-pap, I never used a CPAP. Hi Hippie! 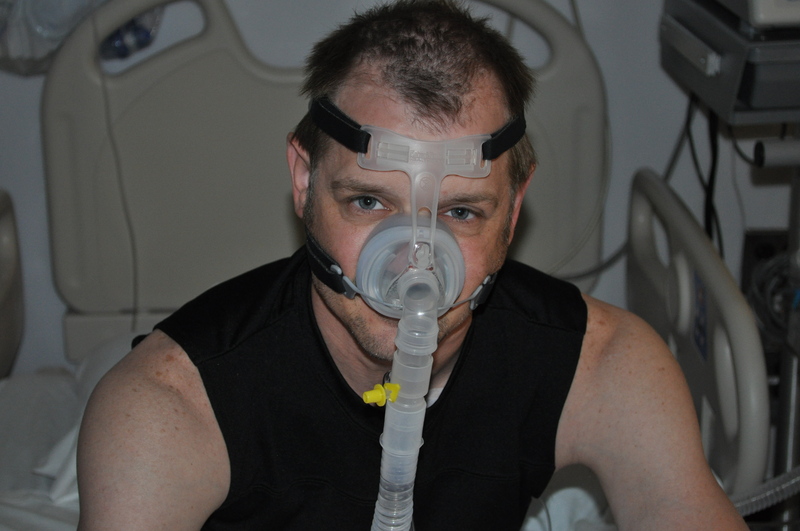 Jody’s doctors wanted to start him with CPAP instead of Bi-PAP. The pressure with CPAP stays the same with each inhale/exhale. He still doesn’t have the machine at home yet because the doctors are working with the insurance company to get it approved. It’s so frustrating to me how insurance companies dictate care & treatments.